The year 2008 changed the movie world forever. Iron Man was the start of the Marvel Cinematic Universe and the Batman Begins sequel began something else entirely. Christopher Nolan’s infamous The Dark Knight became the first comic book adaptation to make over $1 billion and is still considered today as a cinematic masterpiece by both fans and critics. The Dark Knight proved that superhero films could be dramatic, dark and serious but it also proved IMAX was a legitimate film-making tool. Before IMAX began converting large standard auditoriums into digital IMAX auditoriums, IMAX screens used to primarily be giant screens used primarily to exhibit documentaries. Beginning in 2002, other mainstream blockbusters were shown in IMAX, but none of them used IMAX 15/70 cameras and were remastered for the format instead.The Dark Knight was the very first Hollywood feature to utilize IMAX 15/70 mm cameras for an entire 28 minutes of run time, a feat which, to this day, few directors have replicated. An IMAX 15/70 camera is heavy, unwieldy, expensive, and rare. Using such cameras to shoot action sequences requires a truly dedicated director, crew, and studio. Thankfully, The Dark Knight had all of that. IMAX giant screens have an aspect ratio of 1.43:1, also called the “big square.” It differs from the standard widescreen ratio (2.39:1) by granting more image on the top and bottom of the screen. 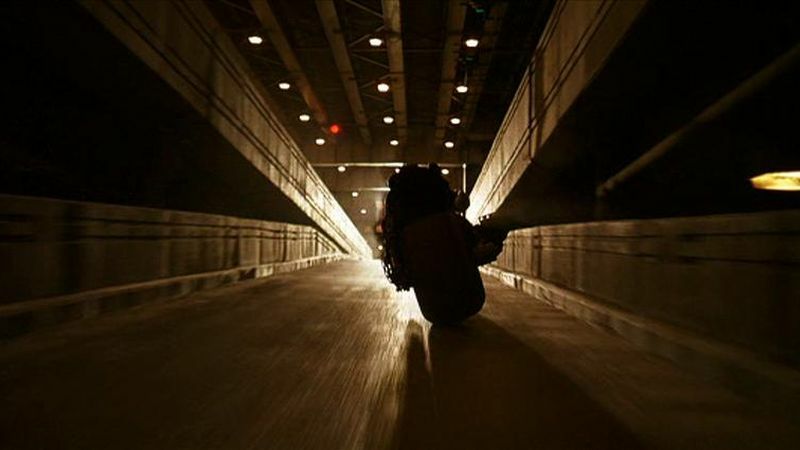 The Dark Knight was shot in non-IMAX cameras for everything except six sequences. These are the sequences that became some of the most memorable practical action scenes in recent movie history. As soon as the dark blue Warner, Legendary, and DC logos pass, the audience sees a bright shot of a Chicago building. It’s an instant stunner as the camera pans closer until one of the windows breaks. 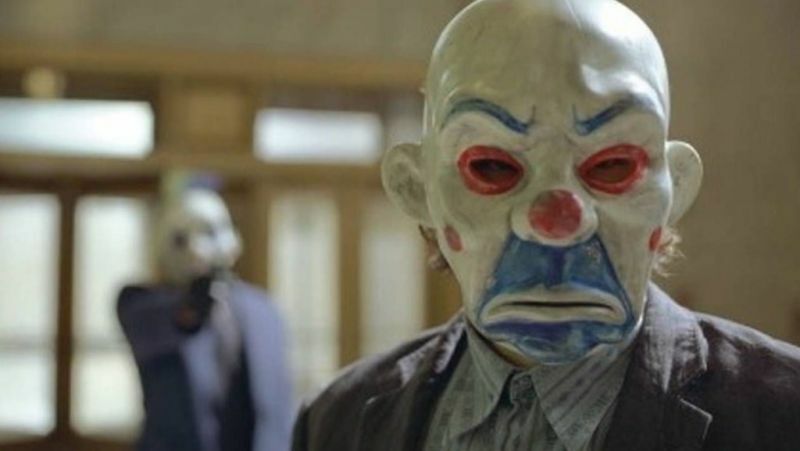 What seems like a simple bank robbery is in fact the beginning of the Joker’s scheme. Completely shot in 15/70, it was an intense and gripping experience for IMAX audiences. 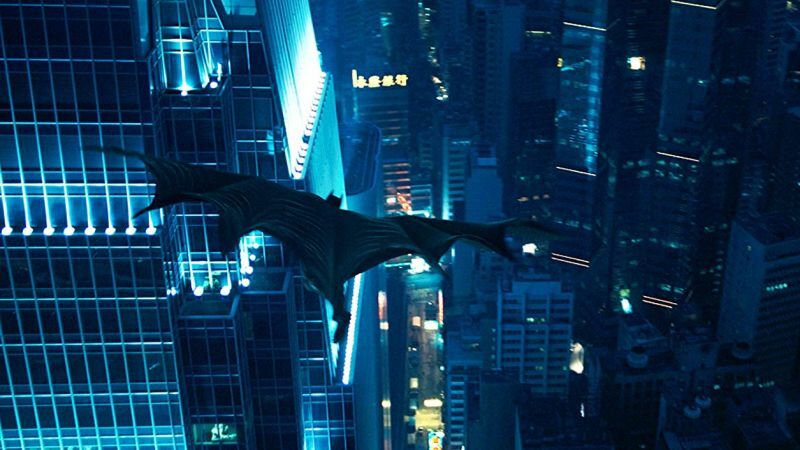 As Batman swings himself from corporate skyscrapers, IMAX 15/70 captures the entirety of the Hong Kong skyline at night. It’s something extraordinary to see Batman jump off one building and into another at lifelike heights. Giant screens can be 50, 60, or even 70 feet tall and The Dark Knight utilized the entire aspect ratio for Batman’s jump. One of the most iconic scenes of the movie is the car chase involving the Joker, Harvey Dent, Gordon, and Batman, all facing off in the middle of Gotham. Seeing the Batpod approach Joker on such a large scale and flip a truck in the middle of an urban street makes for a thrilling experience. Bruce Wayne drives his not-so-subtle Lamborghini through Gotham at daylight before crashing into another car to save Jim Gordon’s life. 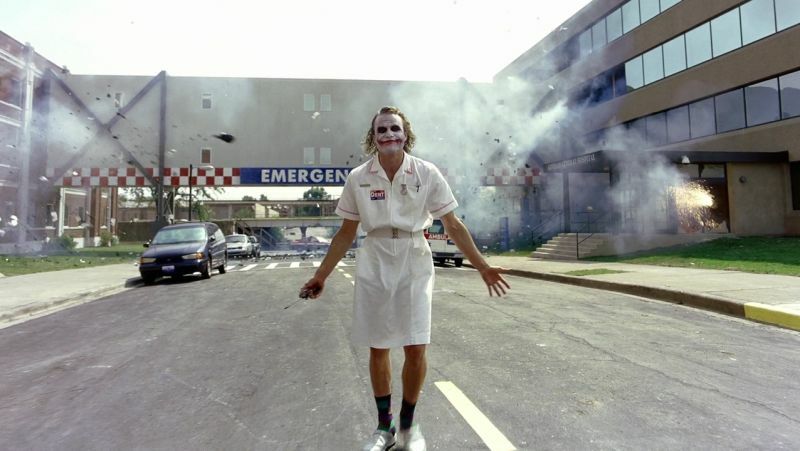 In the middle of all of this, the Joker brilliantly convinces a broken Harvey Dent to “introduce a little anarchy” which concludes with a long, slow and intense hospital explosion in 1:43.1. From Batman finding guards with his bright blue motion sensor glasses to him finally coming face-to-face with his nemesis, the big square allows the audience to dive into all of the movie’s final fight. The final goosebumps-inducing montage of the film utilizes the big square to conclude our journey into the Batman’s emotional sacrifice when Gordon destroys the Bat Light, Alfred burns Rachel’s letter, Lucius Fox destroys his warehouse network, and The Dark Knight goes off into the night with the city’s police force running after him. IMAX 15/70 cameras capture all of those moments in their full grandeur before the film cuts to credits. While there are only 28 minutes of IMAX camera footage in The Dark Knight itself, many other movies decided to take advantage of the IMAX format. Digital IMAX was introduced into hundreds of theaters and today IMAX Laser gives giant screens the opportunity to digitally mirror the size of 70 mm projection. In 2008, only nine movies were released in IMAX. By 2012, that number grew to 39. Last year, over 60 feature films were shown in IMAX. Arri has developed more practical digital IMAX cameras and IMAX remastering is becoming standard practice for virtually every blockbuster not shot in IMAX. If you missed The Dark Knight in IMAX, you’re not out of luck. This year, the film will be re-released on select giant screens late August and early September for it’s 10th anniversary. The six IMAX sequences can also be found in their expanded aspect ratio on the DVD and Blu-ray special features discs of The Dark Knight. The post How The Dark Knight Revolutionized IMAX appeared first on ComingSoon.net.